Coffee makers are probably one of the most used appliances that can be found in our kitchen. The constant, daily use, perhaps even several times a day, makes our machines prone to bacteria and other contaminants. This is mainly due to pouring tablespoon after tablespoon of coffee grind which after all, is a perishable good. As a result, the quality and taste of coffee becomes worse and even harmful with every passing use of a dirty, unclean coffeemaker. 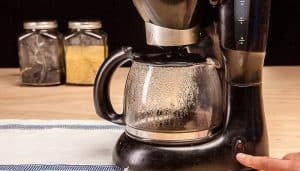 According to a study conducted by NSF International which tested twenty-two households, half of coffeemakers in the world were found to contain mold and bacteria. 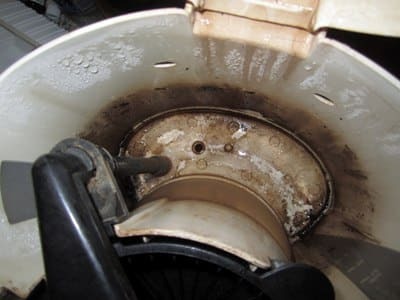 Disgustingly, the level of mold and bacteria in these coffeemakers were higher than the levels of dirt in toilets and bathrooms! 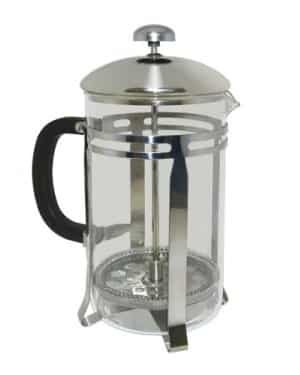 Furthermore, a dirty coffee maker prevents your machine from running properly and the grime that stops up your machine imparts flavors on your coffee, having a serious impact on the flavor of the cup. The most obvious solution is to clean your coffee maker, Keurig, or espresso machine routinely with some Brew Rite, Urnex Cleancaf, or at bare minimum vinegar! If you are in a bind however and don’t have any of that on hand then read on, there are a few ways to do a little diy cleaning. 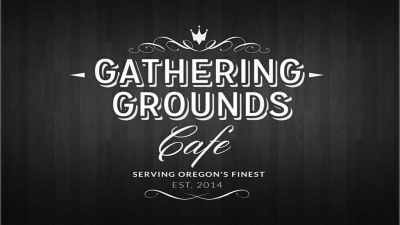 Note – If you are looking to clean a Keurig coffee maker click here. As stated above the best way to clean a coffee machine of any sort is by using a dedicated cleaner/descaler. We’ve got a full post on this site dedicated to our thoughts on all the best coffee machine cleaners on the market. If however you don’t have any of those on hand either (which I’m assuming you don’t since you’re reading this article) is to use an acidic product that will do the job of breaking up mineral buildup in place of vinegar. The most obvious product that fits this bill is lemon or lime juice. You can use either fresh juice squeezed from the fruit or use the grocery store packaged juice. They aren’t loaded with extra sugars and the acid in the juice is strong enough to kill bacteria and loosen up mineral deposits. According to Livestrong an ounce of squeezed lemon juice has over 1.4 grams of citric acid, and The Spruce has a great article on the cleaning and disinfecting properties of citric acid. 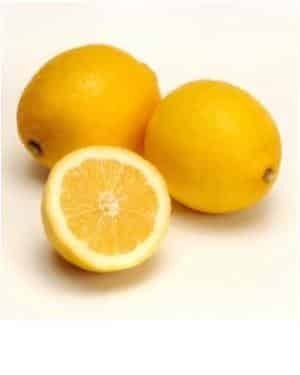 If roughly 5-8% of lemon juice is citric acid and that acid kills bacteria, mold, and mildew while also helping to remove calcium, lime, rust deposits from hard water it’s safe to say that lemons are probably the best way to clean your coffee machines, Keurigs, Nespressos, and espresso machines save for vinegar or dedicated machine cleaners. Unfortunately lemon juice is more pricey than the other options, that’s why most people just clean with plain white vinegar. Lower on this page I’ll discuss the other alternative – cleaning your coffee equipment with baking soda, but to summarize here I’ll say it’s doable but probably not the best idea. There are things you can do to prevent your machine getting dirty, like using filtered water, but even this won’t prevent the need to descale your machine. You’ll most likely need to give your machine a good clean every month or so, depending on how often you use it. You would think that since a coffee maker essentially brings water to a boil it would stay clean but coffee contains oil and as you know, water and coffee don’t mix. The oil always remains and slowly builds up, then bacteria starts growing. Blech! You might then be wondering, coffee makers are equipped with heating material and heat kills bacteria so how come these molds are able to resist and thrive in my appliance? Well, the hot water our coffeemakers generate is not hot enough to kill bacteria (water must be boiling hot or at least a hundred degrees Celsius). In addition, it takes quite some time for the bacteria to die. Running boiling hot water over the contaminated surface is not enough to save us from a dirty cup of Joe. Relatedly, the bacteria can transfer from inside the machine to carafes by means of air, or through the coffee itself. This doubles the health risk and drives home the point of the importance of cleaning our coffee makers. Given the current predicament that hot water and scrubbing off the inside of the machine clean aren’t viable options, human ingenuity takes over with a simple fix; vinegar. Vinegar is actually one of the earliest, and yet, the most relied upon cleaning tools out there. The acetic acidic property of vinegar, formed through the fermentation of starches and sugars, is what makes it a great cleanser. Tests show that vinegar is so effective it is able to kill 90% of mold and 99.9% of bacteria. The best part is that since vinegar is edible, it does not pose any health risks when accidentally ingested. And as I said above, you can buy a big vat of distilled white vinegar for a lot less than it costs to buy lemon juice or commercial descalers. Besides killing off germs inside coffeemakers, vinegar also makes for a great descaler. Firstly, let’s keep in mind that tap water is unfiltered. It contains many molecule-sized impurities. The level of impurities depends on each location. 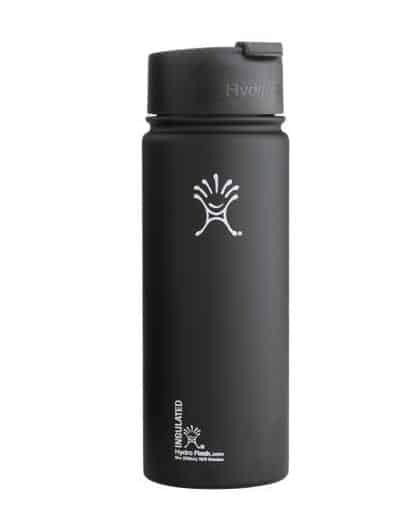 You might have heard of hard water, which contains plenty of impurities. Of course, our bodies are in a way hardwired to handle the impurities. Unfortunately, our machines aren’t. Through time, these impurities build up and this affects the taste of coffee. Descaling is the term referring to the process of removing the impurity build-up in our coffeemakers and vinegar makes a great, cheap and convenient tool for it. Descaling is an often overlooked process of the coffeemaker care aspect. Failure to descale not only results in poor-tasting coffee, the mineral build-up is also known to cause harm to your machines. Again, it should be emphasized that vinegar is safe for our bodies since this it is edible. This is a great upside especially for households which have children since one does not have to worry about keeping commercial descalers out of reach of children. Furthermore, vinegar is safe not only to our bodies but also to the environment compared to cleaners which have chemicals contained in them. One does not also have to worry about properly disposing of these chemicals. On the other hand, one can simply dispose of vinegar anywhere since it is a biodegradable product. The cleaning/descaling process begins with the user filling the coffeemaker’s reservoir with equal parts water and vinegar. Brew the solution until it is half empty. Let the coffeemaker rest for half an hour then begin brewing the latter half of the solution. Afterwards, “rinse” the machine by brewing water. Do this step twice. Afterwards, clean your basket and carafe with soap and water and dry properly. If there is still a smell of vinegar present, do another water brew until the smell is gone. Remember to also wash the outer area of the coffeemaker using a damp cloth. The cleansing/descaling process is recommended to be done every six months but for areas with harder water, three months is advised. 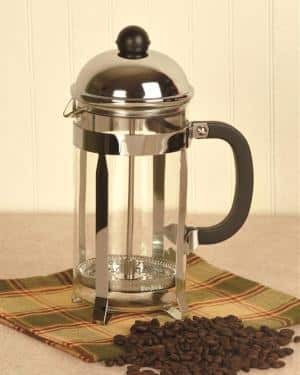 Though vinegar maybe the embodiment of the ultimate coffeemaker cleaner, that is not the case as it has some drawbacks. Firstly, some vinegar may produce a very powerful odor that kills all the excitement in considering it to clean your coffeemaker. As a result, repeated rinsing is necessary and this takes a lot of time, effort and water to complete. Secondly, vinegars have their limitations in cleansing. Dezcal and Full Circle Descalers are found to be more effective in killing more bacteria three and a half times faster than when using vinegar. Also, vinegar is not as effective in removing grease in machines. Repeated attempts are necessary to break down and ultimately remove grease but as mentioned, commercial descaling products are available which can do the same task much more quickly. The most common method of cleaning a coffee maker is with vinegar, usually white vinegar because it’s the cheapest option and of the types of vinegar it is the least difficult to rinse from your machine afterwards. Although white vinegar is cheap and effective, and it may be the lesser of the evils where the leftover vinegar taste is concerned, but it still flavors the machine until a good few rinses later. If you’re not prepared to put up with the potential contamination of your morning roast then you can use other solutions. Lemon juice contains the same degree of acidity as vinegar but doesn’t leave so much of itself behind in the machine. It’s a great substitute as far as performance goes, the problem is that you’ll need an awful lot of lemons to get the job done. If you’re hand squeezing you’ll need dozens of lemons, if you’re buying prepared lemon juice it’s down to the cost. As lemon juice is a straight vinegar substitute, the cleaning method is the same. Fill your usual water container with a lemon juice solution made up of one third to a half with lemon juice. 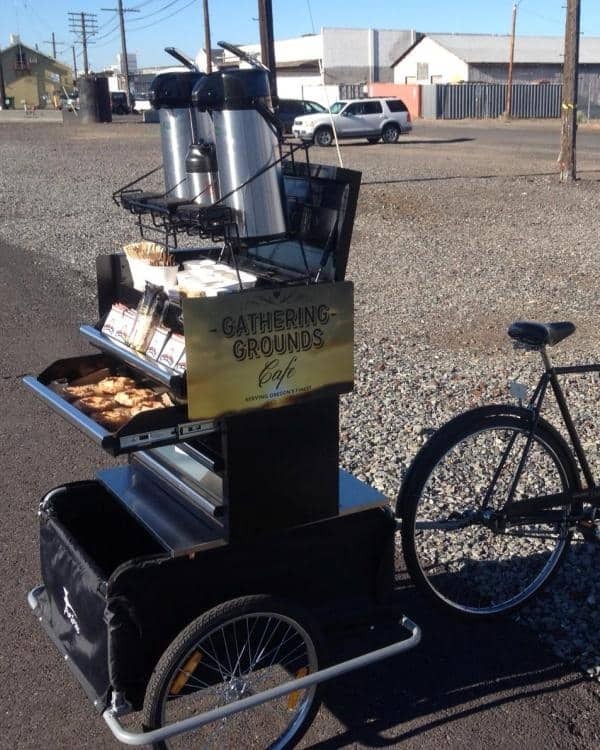 Then run your machine through a brew cycle without putting any coffee in it and there you have it. You might want to rinse the machine with another brew cycle with only water to get rid of the taste of lemons, but you might like the flavor. 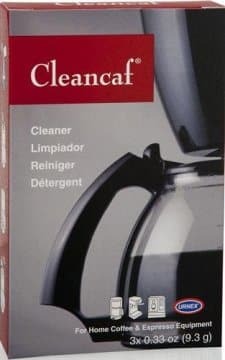 This is one that some people use, but while it is excellent for getting stains off the outside of the coffee maker, if you’re running a machine that needs to be descaled then adding any powder may well cause you problems. Baking soda won’t entirely dissolve in the water, and the small particles that remain can be left behind in your machine, adding to your problems rather than solving them. Baking soda is commonly used to clean basic coffee equipment, it is very effective at this too. the problem is when you already have a build-up of residue inside and you’re adding to it significantly by using baking soda solution. The best alternative to vinegar, by a long way, is lemon juice. But while it cleans just as well as vinegar, you’re likely to need to spend a lot to get the required amount of lemon juice and you’ll still need to rinse the machine afterwards. If you want to clean your machines better then go with a commercial cleaner and descaler. They are priced competitively to lemon juice and clean better and faster than vinegar. With the baking soda method there’s just a lot of extra hassle involved to achieve the same clean machine as you’d get with vinegar. Vinegar Is NOT Cleaning Your Coffee Maker Like You Think It Is! Even after running vinegar through your coffee maker it is still full of bacteria and hard water deposits. Join our email list below and you'll get to see why that's the case and what to do about it.